A cell is the basic fundamental unit of all life on Earth. It contains numerous important structures and components that function together, and all parts interact with each other. The cytoplasm is the intracellular space within the cell containing all these structures and components. Cells are often likened to a tiny metropolis. Like any town, a cell needs to create boundaries and to protect itself. Not much inside it is static or stationary, including the cell membrane that surrounds it. All cells have a fluid but defining cell membrane that encircles the cytoplasm, like an old city would have a fluid, protective moat. Because of this, a cell membrane provides a barrier to separate the cytoplasm from the extracellular space. Things are brought in and things are shipped out of all cells, but it would be dangerous to let just anything pass through them without the right credentials. Therefore, we also describe a cell membrane as ‘selectively permeable’ – or only allowing certain substances to pass through. Plasma membranes range from 5 to 10 nm in thickness. For comparison, human red blood cells, visible via light microscopy, are approximately 8 µm wide, or approximately 1,000 times wider than a plasma membrane. At this size, it is very hard to see the exact structure, even with an electron microscope. Therefore, we don’t know what’s going on! Many theories and models were created to describe the structure of the biological membranes, the most acceptable and famous one being the Fluid Mosaic Model. The Fluid Mosaic Model was first proposed in 1972 to explain the structure of the plasma membrane. The model has evolved somewhat over time, but it still best accounts for the structure and functions of the plasma membrane as we now understand them. The Fluid Mosaic Model states that membranes are composed of two layers of phospholipids molecules. Their hydrophilic heads (that dissolve easily in water) meet the water medium in and out of the cell, while their hydrophobic tails (that do not dissolve) are present inside the membrane. Because the phospholipids that form the cell membrane are a fluid substance, the membrane is also considered a fluid structure (similar to oil floating on the surface of water). 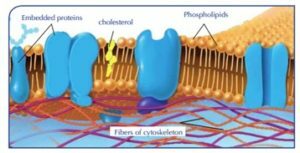 The linkage of phospholipids molecules with molecules of cholesterol contributes towards keeping the cell membrane cohesive and intact. From here we get the name ‘Fluid Mosaic Structure’. Molecules of proteins are embedded between the molecules of these two layers. Some of the protein molecules work as cell identification sites for different substances, such as nutrients and hormones, while others work as gates to pass the substances to and from the cell. Some proteins in the membrane are called ‘intrinsic’. This means that they completely span the bilayer. Others are called ‘extrinsic’ and are partly embedded in the bilayer. Some intrinsic proteins are ‘channel proteins’. These are transport proteins that allow the movement of molecules that are normally too large or too hydrophilic to pass through the membrane by forming a tube-like structure that goes through the whole membrane. At body temperature, the cells function optimally. As temperatures increase, both the cell membrane and the proteins can be affected. The fatty acid tails of the phospholipid bilayer can become more fluid, allowing more movement. This affects the permeability of the cell which may allow molecules in that should not be there, thereby damaging the cell. A decrease in temperature also has an effect on cell membranes and cells. The fatty acid tails of the phospholipids become more rigid at cold temperatures. This affects the fluidity, the permeability, and the cells’ ability to live. When the cells are less fluid, they cannot move or grow. The decrease in permeability also means that vital molecules cannot get into the cell.